Law experts talked about the abnormal outcome of Park Bom's drug case. As announced, MBC's 'PD Note' dived further into Park Bom's controversial drug scandal. Back in 2010, Park Bom was caught using international mail to smuggle narcotic amphetamines. 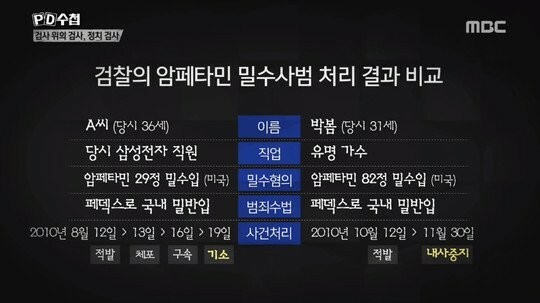 The use and possession of the drug are both illegal in Korea. Park Bom's agency, YG Entertainment, claimed, "It was for Park Bom's depression treatment purposes and she did not know it was illegal." The prosecutor suspended her case, meaning they would neither investigate nor punish her for the crime. Meanwhile, the Samsung employee who smuggled the drug was under arrest and indictment. Law experts claim the ruling is abnormal. An expert commented, "Park Bom used someone to prescribe the drugs in the U.S and smuggled them along with jellies. It's hard to understand how it was ultimately just suspended." Lawyer Cho Soo Hyun who covered drug cases in Incheon also stated, "It's very unusual to suspend the smuggling of narcotic amphetamines. There were no such cases before. The person absolutely needs to be booked, and it's normal for the person to receive at least probation, no more what the situation (behind it) might be." The ruling on Park Bom's case is continuing to bring up questions to this day. Netizens are commenting, "It just doesn't make sense", "I'm suspicious of her agency", "They need to investigate Yang Hyun Suk. Park Bom couldn't have done this on her own", "Smells fishy," "Investigate YG."